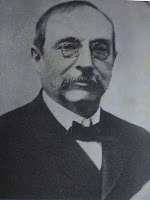 Nerve doctor, scientist, writer, journalist, sociologist, and politician, José María Ramos Mejía (1849-1914) was born to a wealthy family in Buenos Aires, the son of Colonel Matias Ramos Mejía and donna Francisca Madero. Although it is unclear in the published secondary sources where Ramos Mejía was educated, it seems that by the time he had graduated as a doctor in medicine, he had founded the Círculo Médico Argentino and published his first and perhaps most famous (if somewhat polemical) work, titled: La neuroses en los hombres públicos de la historia argentina (translated as The Neuroses of Public Men in Argentina). In 1885, Ramos Mejia was appointed to the Hospital San Roque in Buenos Aires, Argentina’s first service devoted to nervous conditions. Two years later, he was appointed to a professorship devoted to neurology at the University of Buenos Aires. His career, however, was not simply as an academic and physician: he was at one time MP; vice president of the Municipal Commission of Buenos Aires; and Chairman of the Board of Education (1908-1912). He published several books on scientific, sociological and historical themes, including an important work of collective psychology titled The Multitudes Argentinas (1899). He also published in prominent magazines and newspapers – “La Prensa,” El Nacional,” and “Freedom”. Some have described him as the “Father” of South American neurology. Such a label, however, restricts too narrowly the diverse professional eclecticism of his life - those are details that should most interest us.